Tame Impala are an Australian psychedelic rock band from Perth, WA. The band consists of Kevin Parker (lead guitar and vocals), Dominic Simper (guitar), Nick Allbrook (bass) and Jay Watson (drums and backing vocals). They’re a likeable bunch of blokes with an accessible sound, as they incorporate many elements of groove and psychedelia into their dream-like, feel good, melodies. This, coupled with Parker’s soothing vocals, encapsulates a sound reminiscent of another era making them a stand out act in a sea of guppies. In July 2008 the band signed a worldwide deal with independent label Modular Recordings. The signing was soon followed by the release on their self-titled debut EP in September 2008. Tame Impala went to number 1 on the Australian Independent Record Labels (AIR) Chart and number 10 on the ARIA Physical Singles Chart with three songs, "Desire Be, Desire Go", "Half Full Glass of Wine" and "Skeleton Tiger" which received national radio airplay on the Triple J Network. 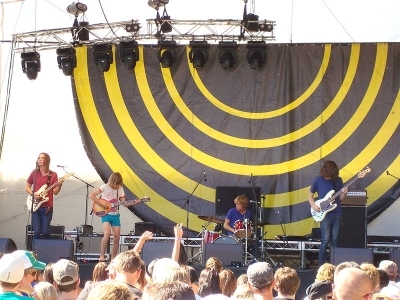 Tours in 2008 included supports for The Black Keys, Yeasayer and MGMT, as well as performances across Australian festivals, and 2009 saw them hit the UK including performances at Nevereverland UK, V Festival, and Groovin The Moo. Tame Impala's debut album, Innerspeaker, was released on 21 May 2010 to critical acclaim, with reputable musical analysts Pitchfork Media paying tribute to them through their best new music section. They also received four 2010 ARIA Music Awards nominations which include, 'Album of the Year' and 'Best Rock Album' 'Best Group' and also 'Breakthrough Artist' and continue to make inroads in the touring circuit with appearances at Reading Festival and sold out dates in New York, LA and San Fransisco. The prospects of this exciting young band are endless and you’d do well to keep them on your radar for the future.